A fun story is doing the rounds of Thai social media about an old Thai man who went in several bike dealerships but no one would pay him any attention. The reason? The man in question looked like he didn’t have two baht to rub together, was dressed in shabby old clothes and flip-flops. He didn’t look a likely customer with his tramp-like grey beard and long hair, reported Sanook. 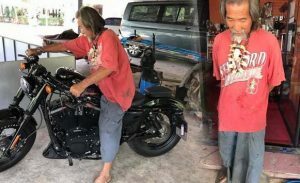 But when he finally got some attention in a big bike shop it only took him just minutes to make up his mind – he said “I’ll have that one!” and he pulled out 600,000 baht in cash from his baggy pants. The story was featured on a Facebook fan page called “Maxsingburimotorbike” that said you should not judge a book by its cover. The page said that the man had been to many shops but the sales assistants had given him a wide berth thinking he had no money. When at last he found what he was looking for the deal was struck within ten minutes. The Sanook story cited a Thai proverb in its headline: “Phaa Khii riw hor thong” a direct translation of which is ‘gold wrapped up in rags’. After the story was shared more than 31,000 times reporters caught up with the man’s elder sister who said her brother was known as “Lung Decha”. She said her brother was an honest, hardworking man who was semi-retired from his job as a mechanic. He neither smokes nor drinks and never gambles. He was not rich but had set his mind on a nice bike for a long time; now he was going to enjoy it.